Today's companies have a variety of broadband connectivity options to choose from whether its fiber, cellular or microwave. However, each approach has limitations, including expensive terrestrial build-outs, a lack of spectrum, or unreliable speeds. It's no surprise that satellite usage has grown in the past decade--it offers a cost-effective way to extend broadband to any location, provides communications continuity, and can be deployed at a moment's notice in any geography or situation. 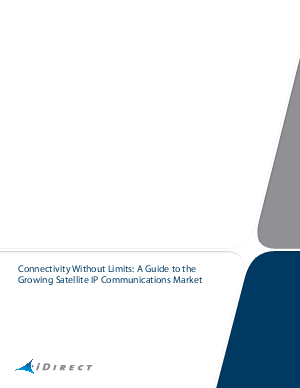 This white paper from iDirect offers insights on how satellite can deliver high-speed, two-way connectivity that overcomes the challenges of distance, weather and terrain. With satellite, companies get increased visibility into operations, greater network reliability, and a higher Quality of Service than many terrestrial networks. In addition, IP-based satellite can be easily integrated into existing network environments and provide reliable, cost-effective connectivity to any location. Discover how satellite IP communications can extend broadband communications anywhere, and meet today's demand for constant connectivity. Download the white paper.